Check out the Ferris wheel! Elm Street in Bethesda Row. 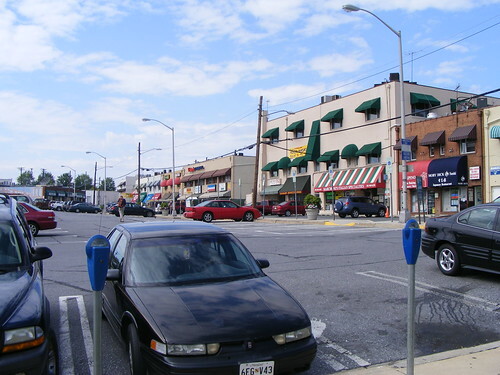 A few weeks ago, I wrote about concerns that a new town square in downtown Wheaton would not be owned by Montgomery County, which raises some serious issues about the public's right to public space. As most of you know, Ellsworth Drive in downtown Silver Spring was leased by the county to a private developer, though County Executive Ike Leggett says it is a "public forum" for free expression. There are no plans for private ownership of the Wheaton town square similar to that in Silver Spring. 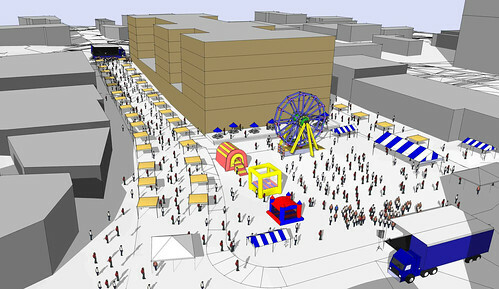 Plans will include active public space including a Bethesda Row type setting as well as lawn and plaza space. The intent is to plan for continued use of this area for highly successful events like Taste of Wheaton but also permit more programming as this becomes a more planned and versatile space. Though the county has given local developer B.F. Saul the rights to redevelop much of downtown Wheaton, it's a relief to know that they will own and maintain the area's most significant public space. Nonetheless, those who fear that revitalization will threaten Wheaton's character might jump at seeing a county official say they want to create a "Bethesda Row type setting" there. Does that mean East County will get its very first Apple Store? Probably not. 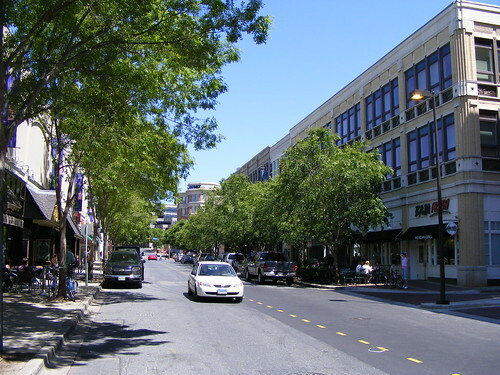 It's more likely that Dise is interested in the urbanism of Bethesda Row: buildings close to the street, wide sidewalks with benches and dining tables, lots of activity throughout the day, and a mix of homes, offices and shops. That's a precedent worth repeating in Wheaton. Parking Lot 13 in downtown Wheaton is slated to become a town square. Ten years of discussion on revitalizing Wheaton has revealed a consensus for building up in the downtown while making the area more attractive. Residents are unhappy with the quality of recent development in the town center, but equally nervous about what redevelopment has done to Silver Spring or Bethesda. By ensuring that Wheaton's town square is a public space, it appears that Montgomery County officials are listening to what the community wants. But it won't be until B.F. Saul presents their plans for the area that we know we've avoided past mistakes. Having worked in downtown Bethesda over the years (and downtown Silver Spring), I don't think Bethesda is necessarily lacking in the public spaces department. Yes, it lacks a huge public square like Veterans Plaza, but there are quite a few really, REALLY nice and well-used pocket parks that dot the landscape and provide opportunities for local musicians and artists to perform and display their wares. B.F. Saul's PR reps put up this new "Town Square" tab on their website. Like all good PR it's pretty good at saying almost nothing about the subject. It does look like they're anticipating a dispute over how much of Lot 13 is used for the public square - they link to a PDF overlaying the proposed space on other public spaces in the area and the world. Glad to hear the county isn't planning on handing over the public space! Thanks for doing the leg work and getting them on the record Dan! Good work, Dan. And thanks to George L and his staff. I, for one, am relieved to hear the new town square isn't proposed be a big 10%-grey, two-dimensional surface.